The spring 2012 Middle East cross-cultural group consisted of: Rachel Bell, Laura Bowman, Bridgett Brunea, Janelle Dean, Aaron Erb, David Everett, Paul Ferguson, Taylor Harrison, Anna Hershey, Emily Hodges, Andrew Hostetter, Ariel Kiser, Crystal Lehman, Karla Martin, Michelle Miller, Rebekah Nofziger, Travis Nyce, Krista Nyce, Katherine Pence, Morgan Porter, Joel Rittenhouse, Ellen Roth, Stephanie Shelly, Dan Sigmans, Linnea Slabaugh, Kierra Stutzman, Taylor Swantz, Hannah Swartz, Hannah Tissue, Chaska Yoder. Of the 30 students in this group, 18 are the children of alumni from classes in the late 1970s through mid-1980s, when cross-cultural study was new at EMU. Spirits were high as the 30 EMU students on the 2012 Middle East cross-cultural marched merrily into the Judean desert. Guides had assured them of a short and easy stroll from the Mar Saba monastery to a Bedouin encampment, where a feast supposedly awaited. Spirits remained improbably high as the route wound up and down one rocky, barren hillside after another, and then again and yet again, no end in sight. At last, the weary, hungry group of students crested a final and particularly treacherous slope to arrive at the Bedouin camp, only to discover that the Bedouins had not quite finished cooking. In fact, they had not even begun; dinner would not be served for some time. The sun was sinking fast, along with the temperature, and one could easily imagine serious discontent breaking out among the tired and now twice-deceived college students. Yet their moods stayed bright while they passed the time until dinner, chattering in small groups, entertaining themselves with complicated word games invented during their long hours of travel over the past weeks, rushing around with their cameras to photograph the haunting orange twilight on the rocky Judean hillsides they’d just straggled across. There existed a special sort of intimacy in and among the group, a bond already formed through previous quintessential cross-cultural moments like this that can’t really be replicated anywhere back on campus. You have to be tired and sore and famished and stranded in the distant wastes of the Judean desert to experience and grow from this sort of thing – to be confronted with petty hardships, to weigh these against the real and persistent hardships of Palestinian life that you’ve spent the last month observing and participating in – and so to decide to enjoy this unexpected hour with friends before dinner rather than pout about an afternoon that’s gone off script. And so went the group’s last night in Palestine, roughly at the half-way point of a trip that began in turbulent Cairo and ended in peaceful Rome, with significant focus on Biblical history, early Christianity, Jewish and Arab culture, and the ongoing conflicts in the Holy Land. The following morning would mark a significant transition, when a bus ride of a few short miles would carry them from the Palestinian town of Beit Sahour to Jerusalem, the capital of Israel – on the other side of a tall concrete barrier with a name, purpose and symbolism that depend entirely on who’s talking about them. Days earlier, the group had visited Hebron, where Jewish settlements in the heart of the West Bank’s largest city exist as a volatile microcosm of the larger conflict between Jews and Arabs. After touring the city with Christian Peacemaker Teams volunteers, who support non-violent Palestinian resistance to Israeli occupation, several students met a Jewish settler studying to become a rabbi, who was eager to share his own very different take on life and purpose and justice in Hebron. “That was the first time I realized how elusive truth was going to be on this trip,” said Aaron Erb ’14. Bridgett Brunea ’14 said the rabbinical student’s enthusiasm for sharing his story revealed a human side to the settlers – and cast the conflict between the two into even more ambiguous light. Did Americans Do This Too? On a different trip to Efrat, another Jewish settlement in the West Bank, the students met with a settler originally from Chicago who confronted them with the disconcerting observation that they too are settlers – isn’t the whole United States built on stolen land? Unable to offer any sort of reasonable rebuttal, the group had arrived at another waypoint of the Middle East cross-cultural: silent confusion. “It’s hard for you to comprehend everything. It’s so emotionally draining,” said Hannah Swartz ’14. There had been many such classic moments, and there would be more. They’d been through the lows, such as the unexpected necessity of crossing the Gulf of Aqaba on a ferry packed with hundreds of men from the region, when divergent cultural assumptions about gender and sexuality left EMU’s females feeling vulnerable. They’d been through the highs: the friendships they’d developed with their host families; the friendships they’d developed with one another; the time in Jordan when they’d sung a song together in a resonant stone chamber carved millennia earlier in the cliffs of Petra. And they’d experienced the incredible weirdness of cross-cultural exchange: while climbing Mount Sinai, the group happened upon a band of Korean pilgrims singing a Korean rendition of “How Great Thou Art.” Several of the students joined them with American-style harmony in the chilly winter air on the slopes of a remote Egyptian mountain. By mid-morning the following day, the bus had dropped the group off along a busy street just below Jaffa Gate and the yellowed stone walls of Jerusalem’s Old City. Weighed down with backpacks and suitcases, they shuffled uncertainly down the sidewalk toward Jerusalem University College, where they would spend the next weeks of their trip studying Biblical history and geography. The bus roared off into traffic, the crowds on the sidewalk bustled around and through them, and a new moment had begun. At this point in the trip it was tempting, said several students, to be judgmental, to not approach the people they’d encounter on this second half of their trip with open hearts and minds. It would be tempting, but they knew it would be wrong. They’d come to listen and learn, and they had been warned this might not be easy. 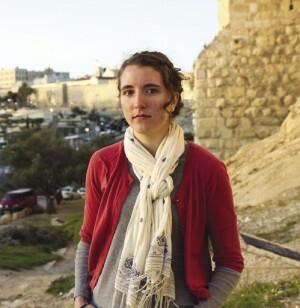 “My job isn’t to choose sides right now,” said Morgan Porter ’13, shortly after her arrival in Jerusalem. As the group settled into their new surroundings, the phrase “What Would Jesus Do?” occurred to Brunea with new meaning and urgency. Jesus would approach “the other side” with love, she said, and she would try to do the same. “It’s a really awesome challenge for my faith. . . . I’m looking forward to the chance, to hear their stories and to recognize that this [land] is their home, too,” she said. 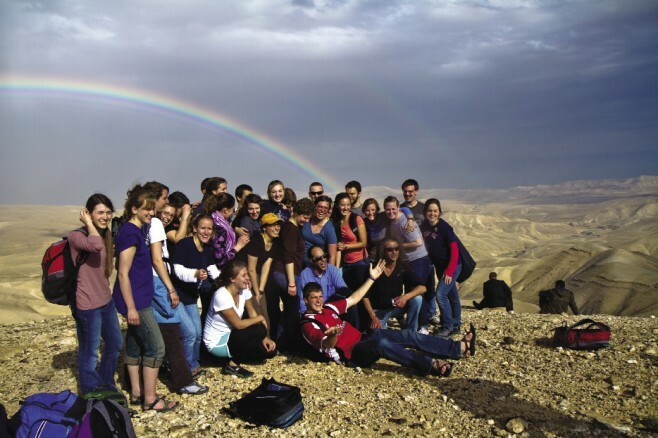 The group began its stay at Jerusalem University College with morning classes and afternoon tours of the Old City, later traveling throughout Israel to visit other significant Biblical sites. 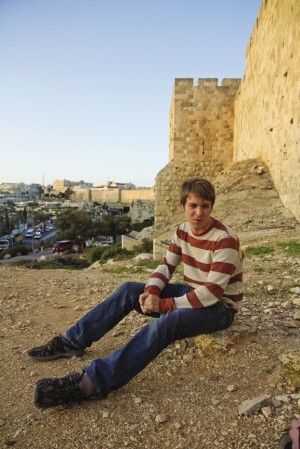 Following a period of free travel, they returned to Jerusalem to begin studying Judaism and contemporary Jewish issues, this time based at the Ecce Homo convent inside the Old City walls. A number of students identified their stay at Ecce Homo as the highlight of the trip’s second half, when their classes were regularly interrupted by ear-splitting calls to prayer from a nearby minaret. From the convent roof, they could see the grey dome of the Al-Aqsa mosque, perched on Temple Mount directly above the Western Wall, overlooked from the east by the Mount of Olives. “It’s like no other place in the world,” said Sigmans. 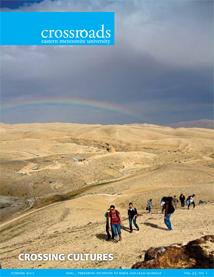 Later stops on the trip included a stay at a kibbutz in the Galilee and a four-day, 40-mile hike along the Jesus Trail (a trail tracing Jesus’ footsteps from Nazareth to Capernaum, co-founded by David ’04 — who was on the 2002 Middle East cross-cultural — and Moaz Inon, an Israeli friend of his). The cross-cultural concluded with study of early Christianity in Greece and Italy, before returning to EMU in late April. As she had expected, Brunea found it difficult at points to sympathize with Israeli perspectives on the conflict. At the same time, she was surprised to encounter numerous Israelis hoping to find a just and peaceable solution to the problem. “It was really energizing to learn how many people there are really working for good change,” she said. Looking back on the entire cross-cultural, Swartz recalled her surprise at the hospitality Palestinians extended to her as an American, even as they criticized her government’s role in supporting Israel’s occupation of Palestine. During the second half of the trip, she realized that she also needed to separate individual Israelis from the actions of their government and military. “People have been willing to forgive my ‘American-ness’, so I should be willing to forgive Israelis for what their government has done,” said Swartz. This emphasis on individual relationships emerged as a major lesson for the students on the trip. After their return, several described newfound appreciation for human connections that exist between people and defy stereotypes, and that create a foundation of respect between people, even when they disagree with each other. “I may not always like what people do to one another . . . but you have to be willing to see the humanness of [everybody],” Brunea said. This was just one of several lessons with broad life implications the students brought home with them. After looking down on Jerusalem from the Mount of Olives and hiking from Nazareth to the Sea of Galilee, and standing on the shore where Jesus called his first disciples, they read the Bible with new eyes and a vivid understanding of its physical setting. Likewise, the region and its place in today’s world have come alive. Their ears perk up when a story from the Middle East comes on the radio; they read stories in the newspaper with greater interest and understanding. “I feel like I care more about the world in general,” Swartz said. A certain jadedness and frustration also accompanied the group home. The seeming intractability of conflict in the Middle East, and the toll it continues to exact on the people who live there, left the group feeling exhausted, even tempted at times to allow the easy rhythms of life at home to push their challenging and complicated experience from their minds. “I don’t want to go back to where I was before I took this trip . . . but at the same time, how do you not feel so emotionally drained?” asked Swartz. 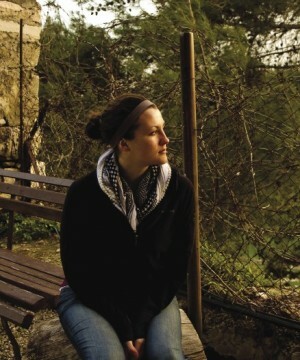 Before Porter spent a semester in the Middle East, she vaguely felt she wanted to be involved in “saving the world.” A few months in a particularly messy and tormented part of the world, though, led her to reevaluate the idea. Days after the group’s return – a frenzied time of graduations and goodbyes atop the stress of readjustment to life at home after a cross-cultural – Ellen Roth ’13 said she expects the experience will remain a lifelong influence. Seated in the coffee shop on campus, she said she has no idea whether her future life or work will involve her directly with the people and places she visited in the Middle East. She’s certain, though, that broader themes from the trip – appreciation for the simpler lifestyles of the people she met along the way, heightened sensitivity to injustice, new awareness of the effects of American policies elsewhere in the world – will guide her in the future. — By Andrew Jenner ’04. Read about his conflicted reactions to his 2002 Middle East cross-cultural. 3 Responses to "Acquiring New Lenses"
Extremely individual friendly website. Enormous details readily available on few clicks.